Stay in the loop with the Monthly Scoop! Take a look at our monthly newsletter! We are all behind you, Becky! Our residents enjoy Walter's music. Arlington and its parent company, Foundations Health Solutions, strive to be a "Culture of Care" - in every aspect of what we do. Happy St. Patrick's Day from Arlington! We are so thankful for the incredible team at Arlington Care Center and how they have created "A Culture of Care" for our residents and families. Check out what's happening in March at Arlington! 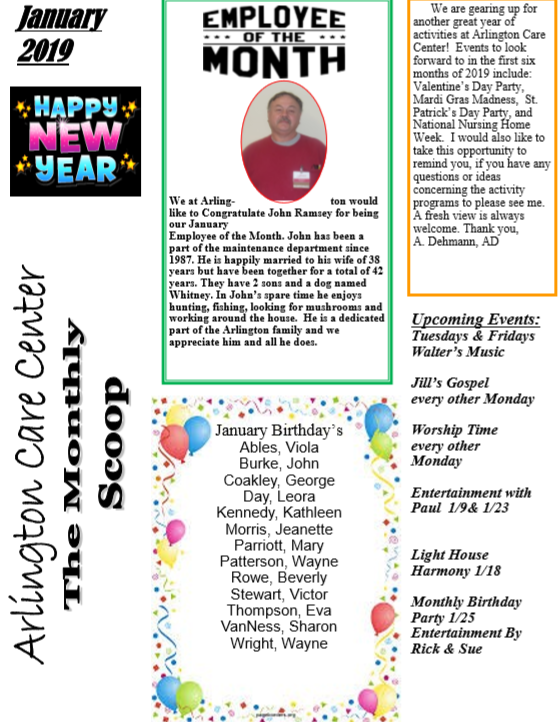 © Copyright 2019 Arlington Care Center. All Rights Reserved.